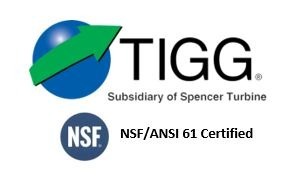 TIGG’s activated carbon NIXTOX Box vapor phase adsorption systems, featuring pre-engineered blower packages, can be used during MGP Remediation jobs as well as other applications. TIGG has a large supply of in-stock systems for sale or ready to rent that handle flows from 50 to 20,000 cfm. The TIGG technical team designed the NIXTOX Blower Packs for use in vapor phase applications with low flow requirements. These self-contained units can be used for emission control to remove organic compounds from air. The N-100 Blower Pack has a blower that is mounted on the lid of an epoxy-lined steel drum filled with up to 180 lbs of activated carbon or other adsorbent media. Once the activated carbon or other media is exhausted, TIGG’s Activated Carbon Exchange Service can be used to transport and dispose of the spent unit. The lid and blower system of the N-100 can be retained and placed on a fresh drums.